Where the Prophet sat and sang to encourage the Indians in the Battle of Nov. 7, 1811. Erected 1929 by General De Lafayette Chapter, D.A.R. at the Battle of Tippecanoe, November 7, 1811. 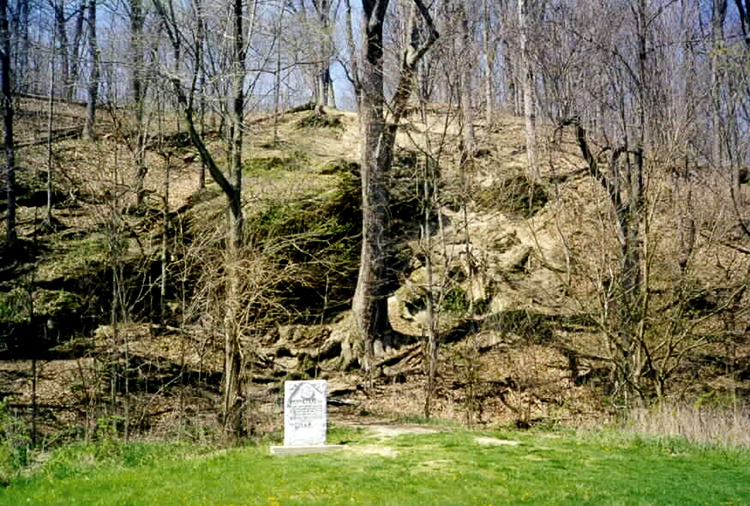 "At least one unique historical landmark was created by the Battle of Tippecanoe. This is Prophet's Rock, located perhaps a half mile southwest from the west edge of the battlefield. The spot is now marked by a monument. 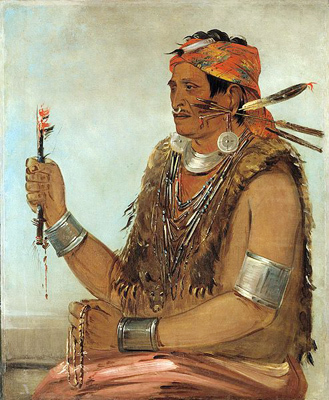 The Prophet, twin brother* of Chief Tecumseh and leader of the band of Indians at Prophet's Town while Tecumseh was absent, stood on an eminence during the battle and chanted to the Great Spirit. This is according to tradition. It is related that the Prophet, who had given his warriors assurance that the bullets fired by the white man would be harmless and that victory was certain for the red man, gave the signal for battle from what has become known as Prophet's Rock. With his chants, he is also said to have shouted encourage- ment to his followers. According to some reports, the voices of Gen. Harrison, commander of the white forces, and the Prophet could be clearly heard above the noise of the battle. 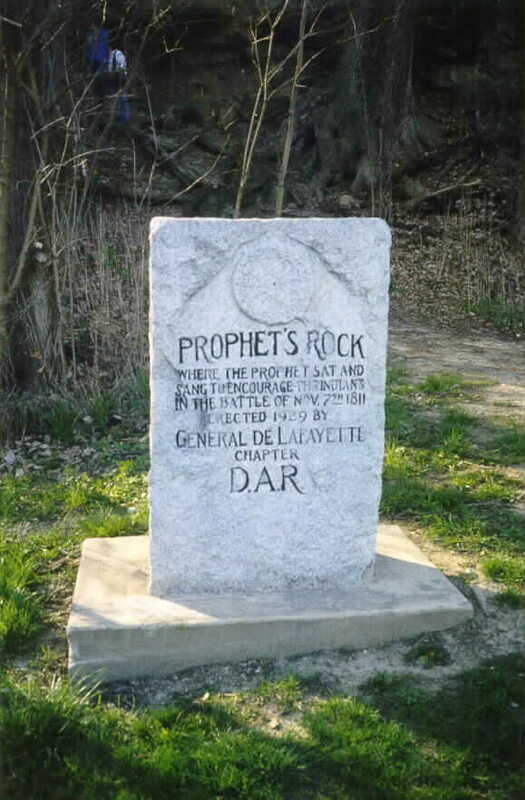 This might seem doubtful as to the Prophet, considering the distance of the rock from the battlefield. Yet it might be remembered that one of his Indian names had the literal meaning of "Loud Voice." So perhaps it was possible for him to be heard. Prophet's Rock is described as an immense mass of conglomerate, high and picturesque, overlooking the battlefield. The rock has been worn into caves, grooves and arches by the eroding forces of the passing years. At the time of settlement, the area was popularly known as "Rattlesnake Den," because of the heavy infestation of these reptiles in its crevices and dens. For some years it was said to have been the custom of nearby early settlers to meet during the first warm days of spring for a "killing" when the snakes would come out to bask in the sun. A by-product of this procedure was a bountiful supply of rattlesnake oil, for which many benefits were claimed as a liniment, such as relieving or curing the "rheumatiz." The spot, located along the blacktop county road leading from Battle Ground southwest to Ind. 43, is owned by the Northwest Indiana conference of the Methodist church. In 1929, the late Dr. W. M. Reser, well known as a local historian, and Mrs. Reser had a stone marker placed beneath the historic ledge in the name of and for the General de Lafayette chapter, Daughters of the American Revolution. It was formally dedicated November 9 that year. A short drive has been graded into the plot, leading off the highway, for the convenience of visitors." *Note: Tecumseh and the Prophet were not twins, Tecumseh was born in 1768, and his brother, the Prophet, in 1771. The Prophet was one of a set of triplets, but not a twin to Tecumseh. Source for this information is from the book A Sorrow in Our Heart-The Life of Tecumseh, 1992 by Allen Eckert.